Source: Las Vegas Sands 2013 10K presentation. 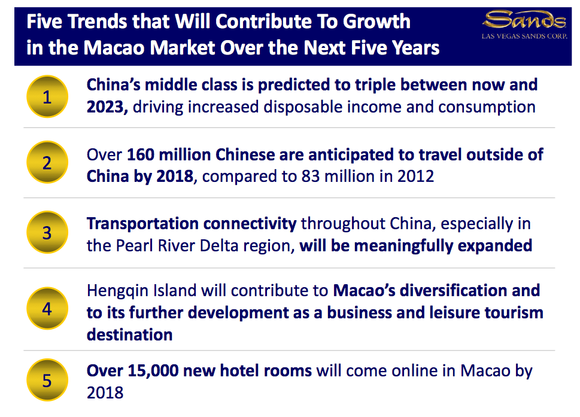 executives have pointed to five trends that will lead to continued growth in Macau over the next five years. Diving into the second trend on the list, the growing number of Chinese citizens that now have the ability to travel outside of the Chinese mainland is driving growth in Macau and driving profits for gaming companies like Las Vegas Sands, MGM International, Wynn Resorts, and Melco Crown . While only 83 million Chinese traveled outside of the mainland in 2012, the number could nearly double in the six years from 2012 to 2018, according to estimates. This growing number of Chinese leaving the mainland for travel and leisure is a bullish sign for gaming investors, because Macau has become a destination for not only the VIP gamblers of China's elite, but increasingly the middle class as well. As more and more Chinese have the means for leisure travel, many of these travelers will begin bringing families to Macau for the entertainment, site-seeing, and, of course, gambling for the parents. According to research by Nielsen Group, the number of mainland tourists traveling to Macau grew 12% in 2013 over the previous year. The research also shows that, while the bulk of tourists to Macau historically made trips to Hong Kong and added Macau as a side stop, more consumers are now going straight to Macau without visiting Hong Kong, showing Macau's growing allure as a travel destination all its own.During this year's Chinese new year celebration from January 31 to February 6, 770,000 mainland Chinese visited Macau, more than the island's 600,000 total permanent residents and 23% more than visited Macau during the same holiday season last year. During the entire month of January, 1.6 million visitors came from mainland China to the gambling island, by far more than any other country or area including Hong Kong. Las Vegas Sands, MGM International and Wynn Resorts are all hoping that their new casinos, which will be completed in 2015 and 2016, can woo families with their mixture of entertainment, dining, shopping, and gambling. For instance, Wynn's new floral themed resort, its first property on the Cotai strip, will be similar to the company's Las Vegas property, the Bellagio. The resort will include a massive lake, a light-and-fire show, a gondola to ferry passengers across the lake, and an assortment of giant animal and floral attractions. MGM plans to have its new Cotai-centered casino completed in mid-2016 as well, for only $2.4 billion, compared to Wynn's, built for a price tag of $4 billion. This lower price may help the company to realize profits sooner from the property, though the resort is not expected to be as grand as that of Wynn or Sands. Las Vegas Sands has already been dominating the Cotai strip with impressive resorts. The two casinos on the strip owned by Sands, TheVenetian Macao and the Sands Cotai Central, have already posted solid growth and revenue. Sands Cotai Central, for example, reported a 61% jump in revenue and a more than 250% surge in operating income for 2013. The company's new megaresort on the strip will be opened a full year earlier than these two, which have target completion dates in summer 2015. The Parisian promises to be even more spectacular than its two predecessors. This $2.7 billion Integrated Resort will include over 3,000 hotel rooms and suites, around 450 table games, 2,500 slots, a retail mall, and a replica of the Eiffel Tower at 50% scale. While Sands is a great bet on the continuing trend toward more leisure travelers to Macau, it may not be the best bet for growth and return to investors following this trend of leisure travelers. One company stands out in family entertainment. Within their very bullish report on the global gaming market in 2014, Hong Kong-based Citigroup analysts pointed to this one company to out-perform in the coming years. That company is local Melco Crown. The analysts believe the investor community has not realized the importance of the company in Macau, nor its international opportunities in other Asian markets, such as Japan and the Philippines. Additionally, Studio City, Melco Crown's coming Cotai property, is said by the Citi analysts to be the best-located casino on the Cotai strip. The City of Dreams resort in Macau brings entertainment to a new level. World-renowned live acrobatic and dance shows housed in the Macau casino, such as the beautiful House of Dancing Water, have made this property a destination for vacationers, even those who are not gambling. As this trend of leisure travel brings more and more travelers seeking entertainment along with their gambling, Melco Crown is in a great position to continue capitalizing on this gain. The vastly growing number of Chinese coming from the mainland to Macau is reason to be bullish on more revenue flowing to the gaming companies in Macau. While the next couple of years will be very exciting, with each company opening up new resorts on the Cotai strip, the company that I'm bullish on for a win on this trend is Melco Crown, with its mix of industry-leading entertainment, well positioned property for its newest casino, and potentially undervalued stock. The plastic in your wallet is about to go the way of the typewriter, the VCR, and the 8-track tape player. When it does, a handful of investors could stand to get very rich. You can join them -- but you must act now. An eye-opening new presentation reveals the full story on why your credit card is about to be worthless -- and highlights one little-known company sitting at the epicenter of an earth-shaking movement that could hand early investors the kind of profits we haven't seen since the dot-com days. Click here to watch this stunning video. The article 160 Million Reasons To Be Excited About Macau Profits originally appeared on Fool.com. Bradley Seth McNew has no position in any stocks mentioned. The Motley Fool has no position in any of the stocks mentioned. Try any of our Foolish newsletter services free for 30 days. We Fools may not all hold the same opinions, but we all believe that considering a diverse range of insights makes us better investors. The Motley Fool has a disclosure policy.